What started out to be a hobby has turned into a full time labor of love. At Connie's Trunks, we get a great deal of satisfaction giving tired, old trunks and antique trunks new life. We're convinced that each antique trunk we complete is about to become a family treasure to be handed down from one generation to the next. About Our Prices: All of our pricing includes insurance, packing, and shipping to any of the 48 contiguous United States. Occasional additional shipping and handling charges (if there are any) due to trunk weight, size, or other special considerations will be clearly indicated within the trunk write up. During the past four years we have restored and sold more than 400 antique trunks and vintage trunks . . . and we have a workshop full of old trunks just waiting their turn. Our goal is to offer a variety of styles and sizes so you can find your "perfect antique trunk." LET US RESTORE YOUR TRUNK: Do you have a trunk that's gathering dustsomething you'd like to restore but simply don't have the time to do yourself? Let Connie's Trunks do it for you. Just email us a photo and we'll follow-up with you to discuss best ways to get the trunk to us to begin the restoration process. Some folks call Connie the "Trunk Nut" because she spends so much time restoring each trunk, but that's what happens when you love what you do. Connie wants each antique trunk to be restored as fully as possible. Each trunk is protected with several coats of Tung Oil or Polyurethane, and then hand rubbed to enhance the beauty of the wood. Remember to visit Connie's Trunks often if you don't find what you're looking for today. 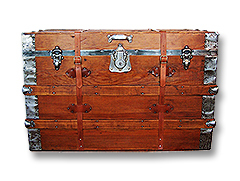 Trunks are added routinely to our Web site as soon as they're completed. Have fun shopping and feel free to contact us with any questions.